Outdated kitchens are often immediately recognizable as belonging to a certain decade. Consider the 1970s, when plastic faux bricks, avocado tiles, and Little-House-On-The-Prairie inspired fixtures ruled. (Wagon wheel chandelier, anyone?) Not only do these unfortunate finishes leave residents living in the past; they also decrease resale value significantly. Fortunately, homeowners can easily update their abodes with modern finishes and contemporary touches. Some of these projects will take a weekend, while others will require a longer time investment. One thing’s certain, as modern home builders can tell you: The more up-to-date your finishes, the higher your home value will tend to be. Read on to learn how to update an outmoded kitchen. Opt for Sleek, Simple Hardware. Switch out ornate brass hardware for brushed nickel or stainless steel. This is an affordable, quick way to modernize any kitchen. Many designers are opting to do away with cabinet-front hardware altogether, and instead opt for finger-pulls that are installed on the cabinet lip. The advantage? Finger pulls de-clutter the kitchen area by removing visual distraction. Install a Modern Range Hood. A new hood will make your kitchen safer, and today’s hood designs are works of art in and of themselves! Curved glass, stainless steel, and slim profiles are hood features to look for when renewing your kitchen. Add Vibrant Countertops. Changing out tired-looking countertops is a sure-fire way to bring any kitchen into the 21st century. Within the last decade, manufacturers have become adept at creating marble and granite countertops for residential applications. Just make sure your gorgeous new counters match your backsplash. In general, either the countertops or the backsplash should “pop.” If both areas are busy, the visual effect will be too crowded. Refinish Cabinets. The days of fussy, busy cabinet fronts are long gone. Refinishing cabinets can be a weekend job. Opt for white or light tones. 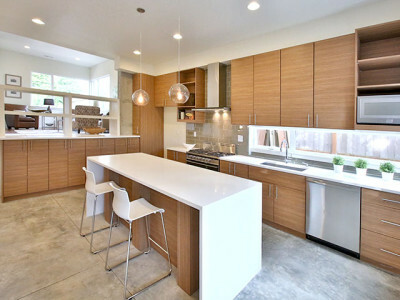 Flat-panel, glossy, white cabinet fronts are especially trendy these days. Dark natural woods such as mahogany and walnut are also “in,” so you may consider updating your kitchen cabinets by staining them a darker color. Just remember that light colors will tend to make a space feel larger, while dark tones may have the opposite effect. Buy New Stainless Steel Appliances. These are timeless. Go for the energy saving options—today’s buyers are keen on green home choices, and you’ll see savings on your energy bill. De-clutter. Given the amount of information thrown at the modern brain, it’s no wonder that today’s designers recommend creating open, clear spaces. A clutter-ridden kitchen will seem smaller and older. To banish clutter, install more storage and spend a weekend organizing. Some of the more clever storage options we’ve seen include pull-out pantries and drawers with caddies for kitchen utensils. Frosted glass-front storage is also trending right now. Create Consistency in Accent Pieces. Chairs, lighting, and decoration should all communicate the same style. Clashing styles will automatically make your kitchen feel disjointed and tired. Repaint. Perhaps a full remodel is in your dreams—but outside of your budget. Changing up your paint scheme is a way to quickly shift the feel in your kitchen. Think neutral tones, nature-inspired colors, and metallic finishes for a contemporary feel. When modern home builders seek to create kitchens with a “wow factor,” they prioritize the features listed above. Even if you can’t transform your whole kitchen, you can choose one or two features to update now. Small changes can have a big impact! We invite you to take a look at some of our upcoming homes to get inspired.